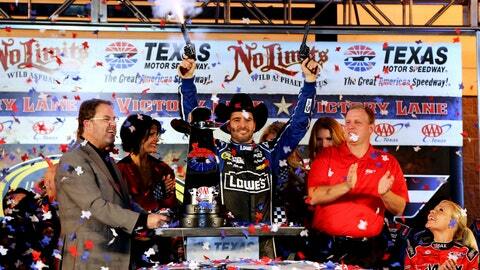 Jimmie Johnson celebrates with Texas Motor Speedway president Eddie Gossage in Victory Lane after winning the NASCAR Sprint Cup Series AAA Texas 500 at Texas Motor Speedway on November 3, 2013. The final 2014 Formula One schedule was released on Wednesday. A conflict in the Lone Star State has some in the NASCAR community shaking their heads. The United States Grand Prix in Austin, Texas is scheduled for Nov. 2 at Circuit of The Americas. That’s the same day as the Sprint Cup Series race at Texas Motor Speedway in Fort Worth. Brad Keselowski and David Ragan don’t think that’s a very good idea. Yikes. This is no good for both series. @bobpockrass: F1 schedule is out … and Austin is the same weekend as #NASCAR in Texas. Neither did TMS president Eddie Gossage who called the move "foolish". More than a few race fans would agree. So #F1 and #NASCAR will be in Texas on the same weekend next year. That was a brilliant move you schedule makers. What two schmucks schedule #NASCAR at Texas & #F1 at Austin the same day? How stupid are we NASCAR & F1? Maybe a conversation to avoid this? WHY WOULD F1 SCHEDULE A RACE THE SAME WEEKEND AS A NASCAR RACE?…. The consensus opinion seems to be that this isn’t a good thing for fans of either sport.